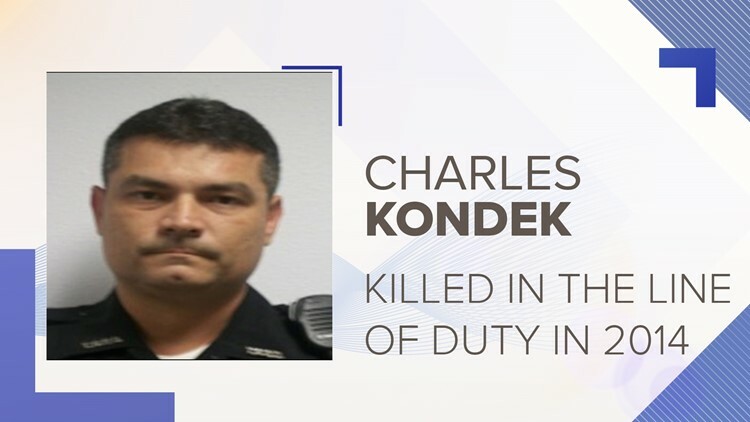 On December 21, 2014, Tarpon Springs Police Officer Charles 'Charlie K' Kondek, a husband and father of six, was shot and killed in the line of duty. He was a veteran of the police force for 21 years. NOTE: Video is the property of the Tampa Bay Rays and was used with permission. Andrew Kondek, 27, smiled as he talked about his father -- but noticeably with a slight twinge of sadness. He has many fond memories of his dad and says he was one of his best friends. "I think everything's, through the stories people have told, I think everything's out there," Kondek said during an interview with the Tampa Bay Rays. "He was caring, outgoing, funny, always down to earth." Now, his son Andrew has joined the police academy in his memory. "It's been something I've been thinking about for about four years now," Kondek added. "I just wanted to make an impact on the community like my father and hopefully be half the man that he was." Kondek has also found another unique way to honor his dad's memory -- using the truck his dad helped him buy to pay tribute to his father and other fallen officers. He converted the pickup truck into a rolling, 'souped up' memorial that has been displayed at car shows and parades across the community. "My father helped me buy my truck when I was about 20, 19 or 20, he cosigned with me," Kondek said. "Once his car broke down, he kind of used my truck for a little bit to get back and forth to work, so it has sentimental value, so I couldn't get rid of it. So I decided to turn it into a memorial truck." The decals are the same wraps that the Tarpon Springs Police Department uses. Kondek had to get a letter from the chief of police to be allowed to use the wrap under the condition that he's not allowed to drive it, and it's transported via a car trailer for different events. "We're very proud of [Andrew]," Major Young with the Treasure Island Police Department said, "And we know that his dad is looking down with pride, and we couldn't be prouder of him." The truck itself was custom-made with his father in mind. The motor, transmission, and drivetrain is from his father's favorite car that he was never able to own. The interior is black and blue, and his father's folded flag is molded into the rear speaker box. "I think he would be really excited for it. He wouldn't really know all of the mechanical side because he wasn't mechanical," Kondek added. "But he'd be really excited for it." Andrew was featured by the Tampa Bay Rays in 2015 when he threw out the first pitch in honor of Officer Kondek.